Jim (William) Dickout - Edmonton's Burial & Cremation Professionals | Trinity Funeral Home Ltd. 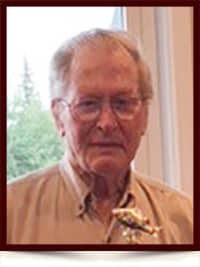 It is with great sadness that the family of Jim Dickout announce his passing on Nov. 22, 2017 at the age of 84 years. He is now resting in peace after a long and courageous battle with cancer. He will be greatly missed by his family and friends. He was predeceased by his wife Jenny; sisters Peggy, June, Joyce, Frieda and brother Ed, Brother-in-Law Leon (Lois), Sister-in Law Vera (Joe) and Daughter-in-Law Kathy. He is survived by children Brenda (Dale), Rick (Mona), Dale and Fran (Greg) and niece Mary. He also leaves behind his grandchildren: Ashley, Jason, Randy (Brittany), Samantha (David), Travis, and Great Grandchild Vanessa. A memorial mass for Jim will be celebrated at St. Clare parish, 6310 – 118 Avenue, Edmonton, AB, on Nov. 29 at 10:30 a.m. In lieu of flowers, donations can be made in memory of Jim to the Canadian Cancer Society.